A clean and modern toilet and shower facility is an essential element of an enjoyable experience so our facility has been designed and maintained with that in mind. 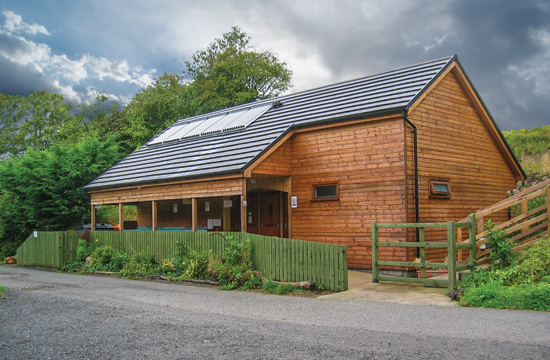 The timber clad toilet block has received 5 star grading from ‘Loo of the Year’ organisation and won "baby changing facility of the year for Wales". There are spacious showers, washbasins, and toilets and 2 individual rooms catering for families and disabled with a toilet, shower and basin in each. The final touch of luxury is under floor heating. We have not forgotten the need to wash up either so 4 sinks and drainers are provided under cover. 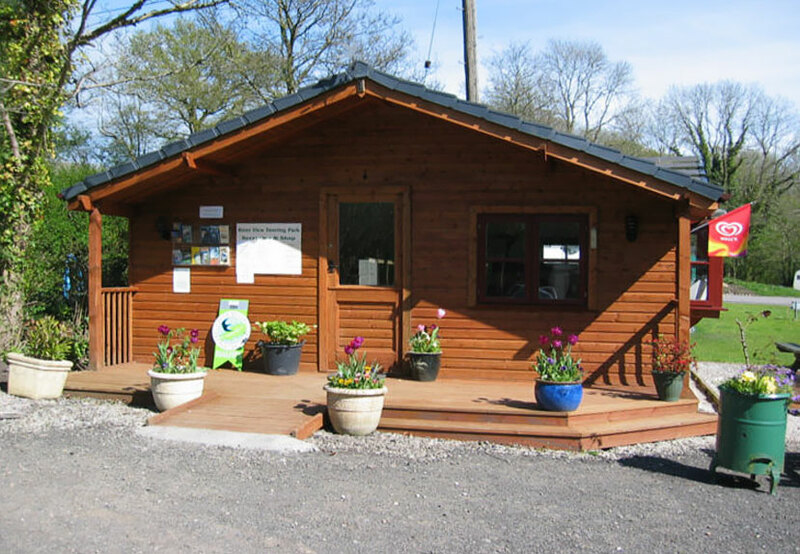 Our reception office contains a small shop which sells everyday essentials including milk, bread, soft drinks, cakes, sweets for the children and some local produce such as Tregroes Waffles and Tan Y Castell Welshcakes. Our own free range eggs are available when our chickens are in full production and we also have local bacon and sausages when available. A book exchange and DVD library are also in the shop and we ask for a contribution to our chosen charity Wales Air Ambulance. If you have forgotten some travel essentials we stock toothpaste, tooth brushes, soap, washing up liquid, cooking oil and other items. Camping items such as pegs and porta poti chemicals are available and we sell Calor gas bottles in most sizes and Campingaz. River View Touring Park covers over 6 acres of our total 16 acre site and we have opened up a short woodland walk that links to our 5 acre hay meadow. This meadow is managed as an ancient hay meadow encouraging an interesting mix of wild flowers including Orchids and Whorled Caraway and is mown around the edge to provide comfortable and easy walking. 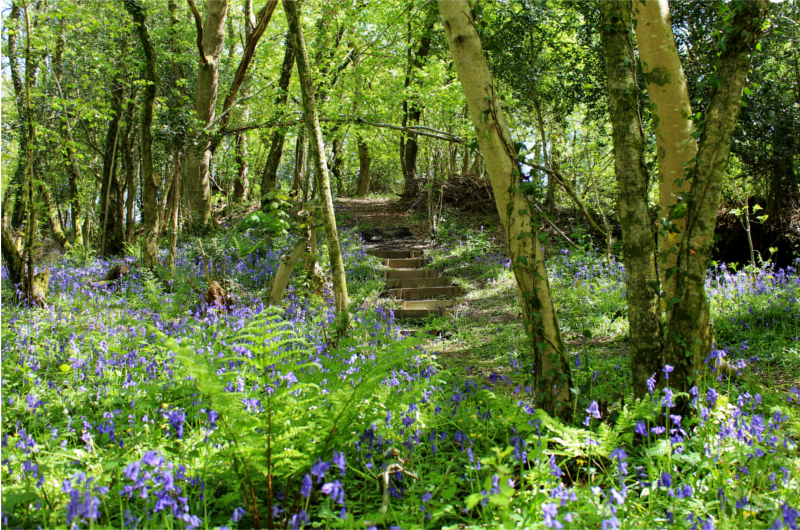 These two areas provide an ideal area for dog walking or a short evening stroll. Another walk is available across the bridge over the river and then up a track which skirts a wooded valley. The more adventurous can cross a style at the top of our hay meadow and walk about a mile to an old ruined cottage that has in recent years been used by a Barn Owl. Please be aware the last few hundred yards can be very muddy even in dry weather. At River View we aim to provide you with a variety of pitch choices with 3 separate meadows of different character. River Meadow is primarily operated as an adult only field and is also best suited to those with walking difficulties. Oakwoods Meadow is our family field with a recreation area in the middle. Our final and smaller field is Gorse Meadow with a total of 12 pitches. Within our three separate meadows we have a mixture of well spaced pitches all with 16amp electric hook-up and all are large enough to take big units. Our 46 all weather pitches are mostly level with a few having a slight slope. The surface is 14mm gravel which is comfortable to walk on but the subsurface is larger stone to provide a sound base. Rock pegs (available in the shop) are recomended to ensure a good solid fixing for awnings. 12 of the pitches are fully serviced with water tap and grey waste drain. In addition to the allweather pitches we have 16 grass pitches for tents or Caravans. If the ground is wet we offer rubber mats for the entrance to the tent or awning, they help stop mud being generated and taken inside and also protect the grass so we both win. When you book with River View we try to understand your requirements and reserve a pitch that is appropriate for you. Glamping has come to River View! 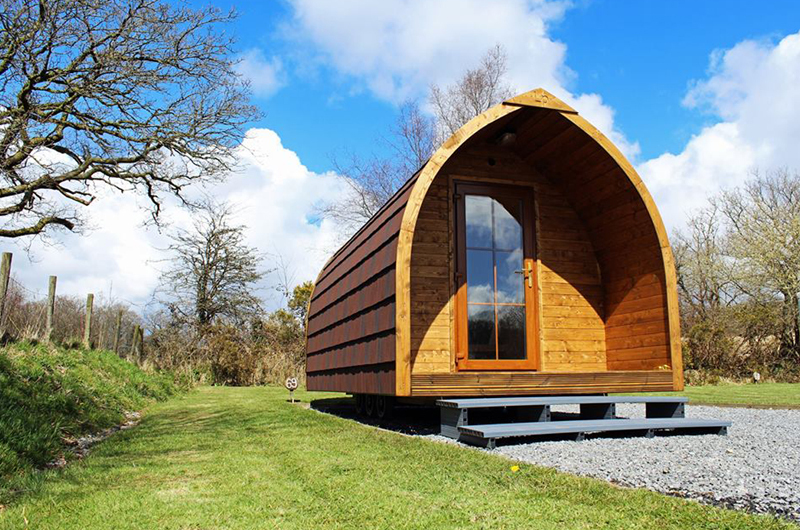 Forget the hassle of a tent come and stay in our brand new log pod sleeping up to 2 adults and 2 children. Made locally our pod comes fully insulated, double glazed windows and doors with the added luxury of underfloor heating for those colder months. What’s included in our Pod: Table for four which converts into a double bed, easy fold camp beds for children. TV & DVD player, kettle, toaster, 25litre mini fridge, mini electric plate, glasses, Mugs, Cutlery, plastic plates and bowls for four. 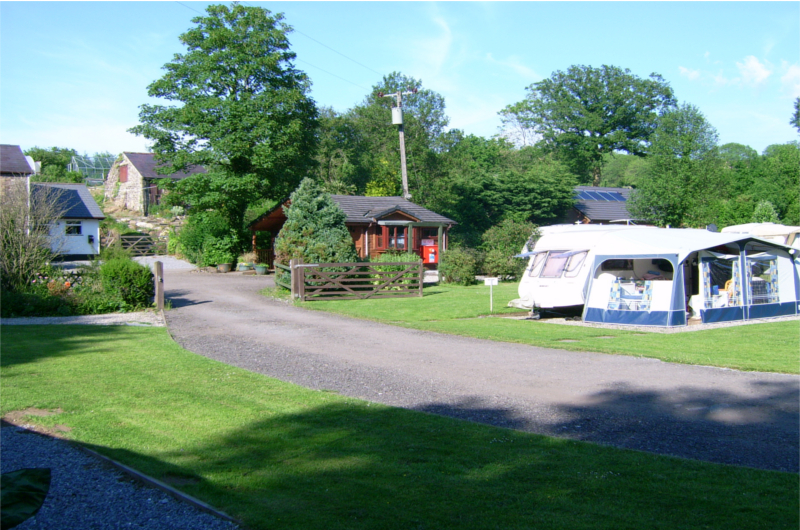 Situated on a roomy pitch with a picnic table and ample parking for your car. What you need to bring: Your usual camping gear minus the tent and what’s included above. Prices start from £35.00/ night. Please call to book as booking is not yet available online. 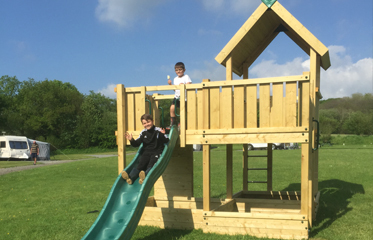 We have a large area in the centre of Oakwoods Meadow that is ideal for interactive games with children and parents often seen enjoying some exercise. We do ask that children do not ride bikes or play with balls close to caravans or tents.